10) Miroslav Klose: Klose is not the most memorable striker in the world, and is in the autumn of his career. But he has always been a fair player and a gentleman, and as part of the German World Cup side he went on to become the most scoring player in World Cup history. Perhaps unlikely, but not undeserved for a player who will be missed when he retires. 9) Lionel Messi: Messi has been criticized for not being at his former level, and at the World Cup, we only saw his genius in glimpses despite FIFA giving him a weird player of the tournament price. That said, he is still a marvelous player, scoring one goal after another, and carrying the entire weight of Barcelona on his small shoulders. 8) Diego Godin: Godin was core in the strong defense of Atletico Madrid which ended up taking the title. On top of this he was also a great threat in attack, witnessed by his crucial goals against Barcelona or against Italy in the World Cup for Uruguay. In my view, one of the best defenders in the world. 7) Thibaut Courtois: It has been the year of the goalkeepers, and at 22 Courtois is set to become one of the greatest ever. He gave Atletico Madrid the tranquility in defense they needed to take the title, and was immediately taken back to Chelsea, where he has continued being a wall. For Belgium he was also a strong last man. An amazing goalkeeper. 6) Toni Kroos: Bayern Munich, Germany, and now Real Madrid. Every team the German plays on seems to win, and he has been (and continues to be) a crucial side of all these sides. He is an outstanding passer. 5) Arjen Robben: It is easy to dislike Robben as he is a prolific diver, becoming infamous in the World Cup after his dive against Mexico. That said, it is undeniable that he is an incredible footballer, playing a crucial role in the Dutch World Cup campaign (taking his revenge on Spain) and most notably for Bayern Munich, where his characteristic runs continue to tear defenses apart (I particularly remember his match against AS Roma). 4) Cristiano Ronaldo: I like that Ronaldo is so competitive that he will settle for nothing less than being the best, and I am happy for him that he received the FIFA player of the year award. His goals for Real Madrid are incredible, and he has become more of a team player, although he will always, foremost, be an individualist. His poor performance at the World Cup showed this. 3) Manuel Neuer: At a time with many incredible goalkeepers, it is difficult to pinpoint the best, but Manuel Neuer it is. He made important contributions to Germany winning the World Cup title (playing almost as a libero against Algeria, he surely prevented a better Algeria for scoring) and is a bastion in Bayern Munich's defense. Neuer is a goalkeeper who would make any team great, and is already playing in great teams. 2) Philip Lahm: The Bayern Munich and Germany captain is often the kind of player most people take time in noticing, but he is the crucial piece in these two great sides. From varied defensive positions he varies between defense and offense superbly, and is often the player with most touches and longest runs. An absolutely world class player, who is already difficult to replace after having retired from the German national team. 1) Thomas Muller: Muller was an instrumental part of both Germany's and Bayern Munich's teams in 2014. Nobody really knows what position Thomas Muller plays, and in that sense, he is perhaps one of the most complete modern players in the world. He can play as striker, offensive midfielder, wing... and will probably define what it is to be a complete footballer for a foreseeable future. It was not an easy list: there are indeed a lot of Germans and Bayern Munich players (there could have been more, with Bastian Schweinsteiger), and even two goalkeepers! I also think this is the first time for many years no Brazilians have made my list, although Neymar came close. But other players who could have come in and thus deserve a mention are James Rodriguez, Zlatan Ibrahimovic, Yaya Toure, Luka Modric, Luis Suarez, Sergio Aguero, Javier Mascherano, Alexis Sanchez and Arturo Vidal. 10) Sevilla: Many Spanish teams are trying to challenge the rule of the big Spanish sides. Although Seville is far from achieving this, they still managed to go all the way in the Europa League, winning the final against the cursed Benfica. 9) Manchester City: The Premier League winners had to be stable and rely on Liverpool's slips to take the league title. They have stumbled in the Champions League, but memorable victories against Bayern Munich and AS Roma have ensured that they are still alive in Europe. 8) San Lorenzo de Almagro: The small Argentina club came to prominence when one of their avid supporters became Pope Francis I. And perhaps it was divine intervention when they went all the unlikely way to win the Copa Libertadores against Nacional from Paraguay. 7) Algeria: African sides largely disappointed again in Brazil. Except for Algeria, who played optimistic football and gave the later world champions a great match. 6) Costa Rica: The Ticos were the great darlings of the 2014 World Cup. Nobody would have guessed they could win a group ahead of three former world champions, and were only penalty kicks away from fighting themselves into the semifinals. Fantastic spirits and awesome fans really made Costa Rica one of the best in the world. 5) Germany Women's U-20: Yes, Germany became World Champion in 2014. Not just in Brazil, but also in Canada, where the young German ladies defeated Nigeria in the final to take the world title. The 2015 Women's World Cup will be in Canada, and be sure that there will be some very exciting sides! 4) Bayern Munich: Bayern Munich have not been as great in 2013, but only because they did not win the Champions League when they were routed by Real Madrid. But they have been awesome in the German league, beating record after record, and played a memorable match when routing AS Roma in Rome in the Champions League. 3) Atletico Madrid: After nine years of total Barcelona-Real Madrid dominance in the Spanish league it was only wonderfully refreshing when Atletico Madrid took the league title. They did not play beautiful football, but efficient counter-attacking, and this also put them all the way in the Champions League final, where they were only a minute away from taking the title. 2) Real Madrid: Under Carlo Ancelotti the team has grown to look more like a football team than a bunch of stars. In this context, Cristiano Ronaldo has outshone his fellow superstars such as Benzema, Bale, James, Modric, Kroos, etc. Although they did not take the Spanish title, they took the Copa del Rey, the Champions League title, and seem set towards taking the league in 2015. 1) Germany: There is one footballing nation above all others: Germany showed in Brazil that they have far surpassed the South Americans in technique and tactics to become awesome World Champions. Germany will be powerful for the foreseeable future and were surely the team of the year in 2014! I was in Manchester and Liverpool a couple of weeks ago. Whatever one goes there for, football is at the forefront, and I saw this not only as I went to two football matches, but also as I was looking for Manchester Cathedral. A small medieval church was totally overshadowed by a huge modern building dedicated to the new religion of the 21st century. 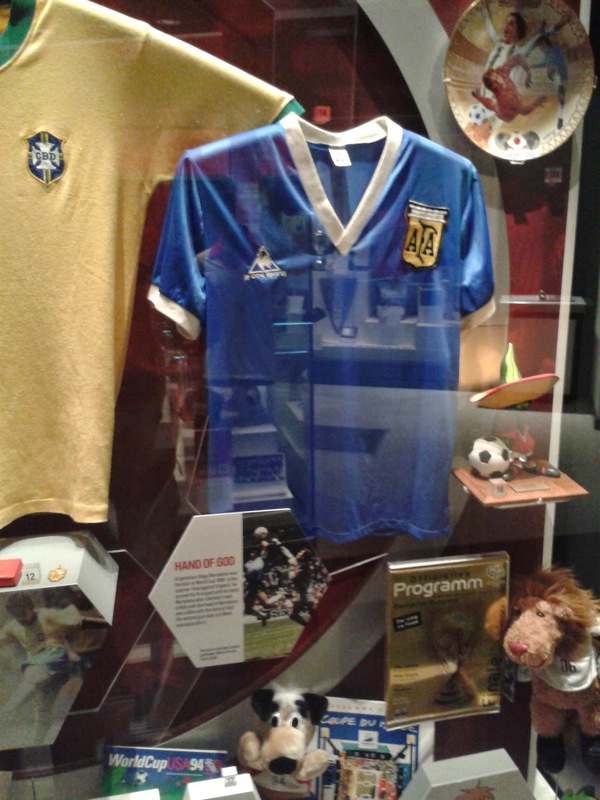 The National Football Museum in Manchester is free to visit, and houses the Hall of Fame of players in the English league, as well as a fine collection of football items, such as the ball from the very first World Cup match between France and Mexico in 1930, or the shirt worn by Diego Maradona when Argentina played England in the 1986 World Cup quarterfinal (and one has to admire the English for displaying a shirt that surely awakens mixed feelings). The exhibitions are organised quite well, telling the history of football in England from different perspectives, and does not shy away from including issues such as hooliganism, stadium disasters, or racism and the fact that Women's football in England was not recognized until the 1970s. I should apologize to Manchester City. After having watched them at their beautiful stadium last weekend, I underestimated them. Before they went into their all-important Champions League match against AS Roma, I did not believe they could do what they needed to do, which was to win in Rome. They were without their superstars: Yaya Toure, Vincent Kompany and most important, the goal-machine Sergio Aguero, who is pretty much the reason they had not been eliminated earlier. Without these guys, I do not believe that Manchester City has any real super stars, and I have not been impressed by their performances in the CL (including their victory over Bayern Munich! It was all Aguero). Manchester City were the best team against an AS Roma that, if anything, disappointed more than they did against Bayern Munich. 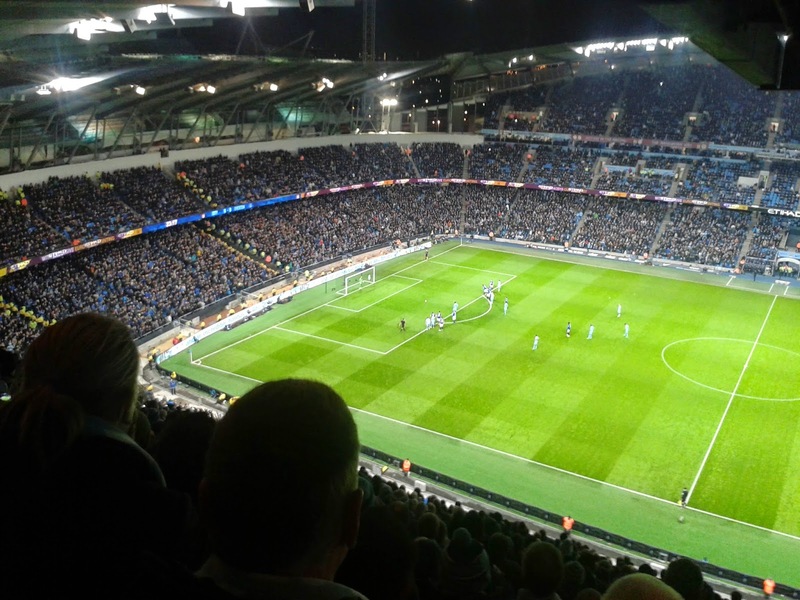 Without forcing things, Manchester City worked hard to pressure the Italians. Every player delivered, not just the goalscorers Samir Nasri and Pablo Zabaleta, but also Joe Hart, who also did his part with a couple of great saves. It was the best team effort by Manchester City this season. Congrats to Manchester City. No team will be comfortable playing them, but they have to play as well as they did last night to have hopes of progressing. 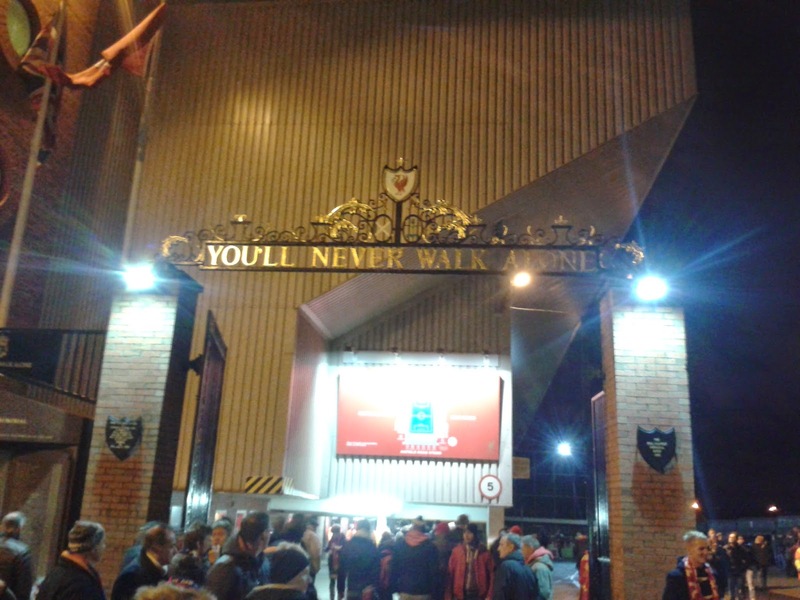 I went to the legendary Anfield stadium, home of Liverpool FC, for the Champions League match between the home team and Swiss FC Basel. Incidentally, Anfield is situated in Everton, not far from Goodison park, where the other Everton side plays. I am not a Liverpool fan. But as a football fan one must be excited at visiting one of the most legendary stadiums in the world. And even for such a match: Liverpool was forced to win to go through! 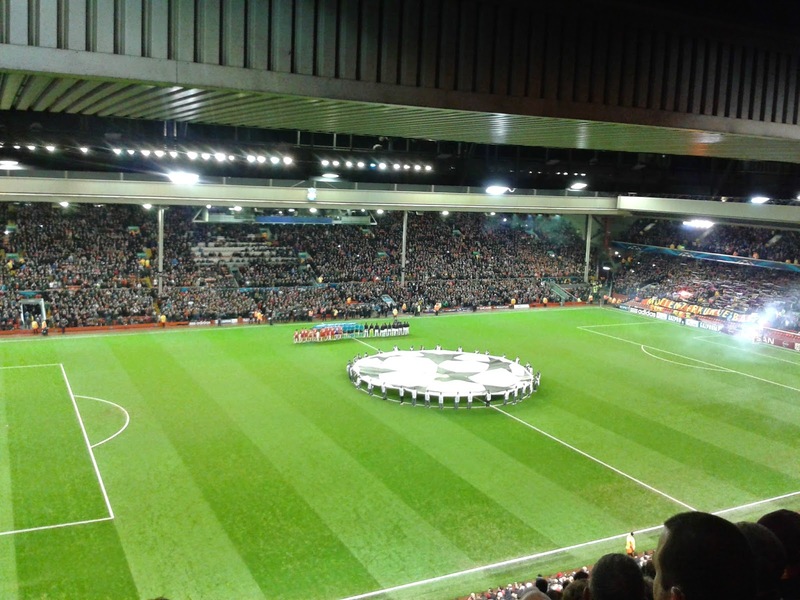 And therefore, I believe I also had justified expectation of seeing a Liverpool side at its absolute best; of seeing a world class side run over a Swiss side that has otherwise done far too well in the CL for many years. But as disappointing as Liverpool have been this season, as poor were they against Basel. In the first half Liverpool's performance unacceptable, more so considering the importance of the match. I've got to respect Liverpool fans for sticking with their team, because I am certain that such a performance in Spain would have made fans turn against their own side. Bad doesn't describe how bad they were, while Basel were solid, had a clear plan, and knew what they wanted. Without too much of an effort they were leading 0-1 on a goal by an excellent Fabien Frey. Things could only improve in the second half, and they did. Liverpool came out with more energy and pressure in the second half, and a splendid free kick by Liverpool's only genious, Stephen Gerrard, gave them 1-1, and hope, despite having lost Lazar Markovic to a silly (but in my view deserved) red card. In the end, a couple of good chances were not enough, and Basel even had some good chances on the counter attack (Mignolet had one great save), so 1-1 was a fair result. Very disappointing for a Liverpool side that simply does not have the quality that put them in the Champions League last season and I think Liverpool and football fans alike have the right to expect more from Liverpool. That said, who needs to win when you have great fans? All repect for amazing Liverpool fans who are the ones to give Anfield its legendary atmosphere. Add to this some splendid Basel fans, where both sides sang and supported passionately but respectfully. Great to see it, and an inspiration to all fans! 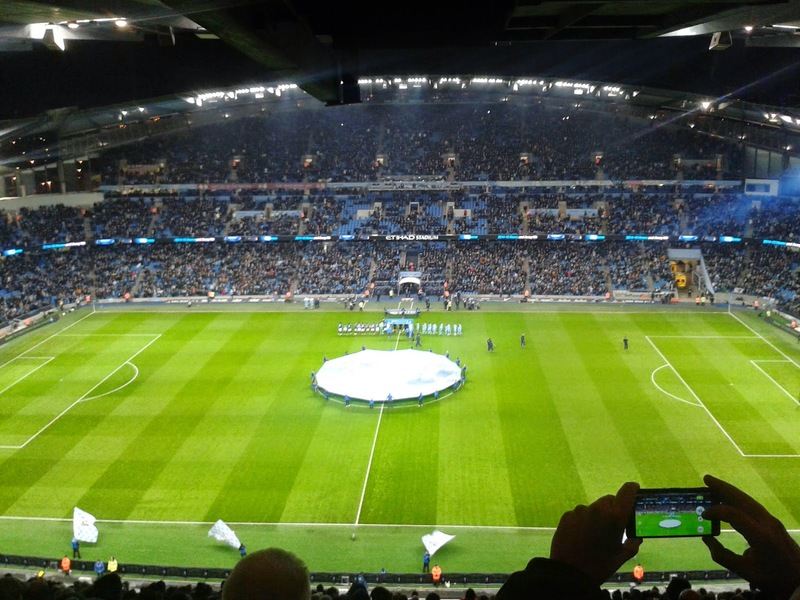 After an all night flight from Monrovia via Brussels I was not too tired to go to watch Manchester City-everton at the absolutely beautiful Etihad stadium in Manchester. The home team won 1-0 on a penalty goal by Yaya Toure. Sergio Aguero got injured and both Joe Hart and Tim Howard had amazing saves. But for me the best was to experience two great teams in the best league in the world.